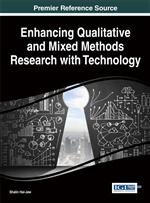 Contributing to the ongoing debate in research on sensitive issues such as business ethics, this chapter provides a discussion of mixed methods research design, examining the processes and challenges of developing and deploying an online survey tool using technology within an interpretive mixed methods design. This chapter provides pointers on how to deploy this approach through technology to research business ethics using the example of researching ethical mindsets and its components, including spirituality and aesthetics. It is found that mixed methods research is an effective approach because it allows often sensitive issues (i.e. business ethics, aesthetics, spirituality) relating to questioning individuals' inner values and ethical propensities, which are usually subtle and difficult to measure and analyze constructs. While this tool was developed in the Australian context, it has the potential to form a foundation for wider examination and research in business ethics. The chapter contributes to the collective discussion of research methods using a framework that has both practical relevance and theoretical rigor. Researchers in the field of business ethics face a number of significant field-shaping challenges and questions. Challenges faced relate to difficulties in obtaining data, while the questions are particularly concerned with identifying and applying appropriate research methods (Benefiel, 2003, 2005). In both cases it may be argued that realist empirical, positivist (quantitative) and interpretive (qualitative) methodologies can be employed together in a complementary way (Lee, 1999; Parry, 1998) that has become known as mixed methods see, for example (Morse & Niehaus, 2009). Researching an area such as business ethics is considered difficult as it deals with sensitive issues relating to questioning your inner values and decision abilities. In his discussion on the design of research for the investigation of sensitive issues, Greener (2011) argues that research in such issues might imply some kind of neglect or other failing on the part of respondents and participants. Thus, to raise sensitive issues, a great deal of thought and care need to be taken into account to avoid giving offence or causing embarrassment. Greener (2011) highlights the need to pay great attention not only to the wording of individual questions but also to the sequence in which they appear to avoid leading respondents to particular answers. Indeed, and most importantly the method employed in research these sensitive issues as business ethics. Debate about the application of quantitative and qualitative approaches to the study of sensitive issues in organizations has resulted in an increased valuing of qualitative approaches. Fornaciari and Lund-Dean (2001: 335), for example, challenge those researching sensitive issues and inner values in organizations to consider evidence about this phenomenon at work from the perspective of non-positivist ways of knowing. They suggest that ethno-methodological, qualitative techniques, and tradition-based stories, are more appropriate research methods than positivist methods, see also (Lund-Dean, Fornaciari, & McGee, 2003). Benefiel (2003) extends this argument claiming that qualitative methodologies should be an integral part of the researcher’s toolset rather than being a ‘satellite’ to the quantitative paradigm. Lund-Dean et al., (2003: 389) defend the use of combined qualitative and quantitative approaches, arguing that the positivist, empiricist methodological is not only insufficient for such study, but may actually cause harm to the discipline. While Denscombe (2008) argues that the mixed methods approach has emerged as a ‘third paradigm’ for social research, and has developed a platform of ideas and practices that are credible and distinctive that marks the approach out as a viable alternative to quantitative and qualitative paradigms each used solely.